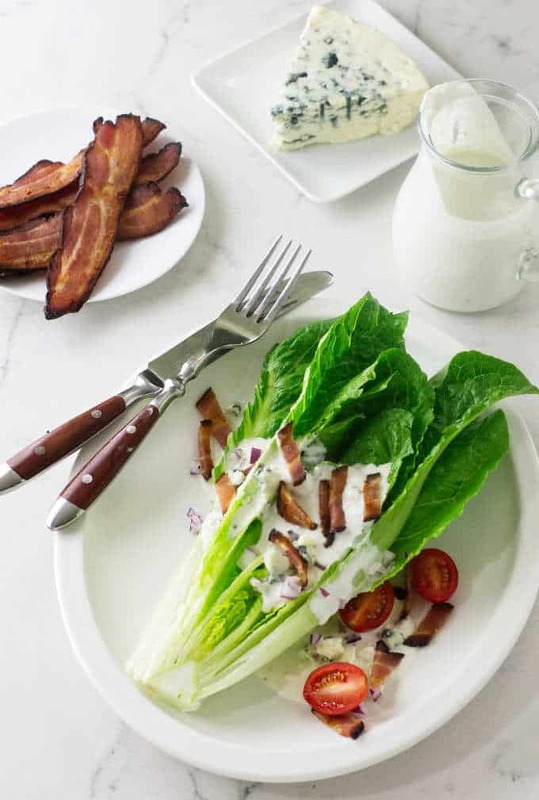 This bacon and blue cheese salad is our twist on the classic Wedge salad. The Wedge is a slice of Iceberg lettuce with blue cheese dressing. We chose to use crisp Hearts of romaine lettuce. We topped each serving with a creamy homemade blue cheese dressing, bits of red onion, crisp bacon and sliced grape tomatoes. The “Wedge” is a popular steakhouse salad item. Another name for this simple salad is “A Knife and Fork Salad’, for obvious reasons. 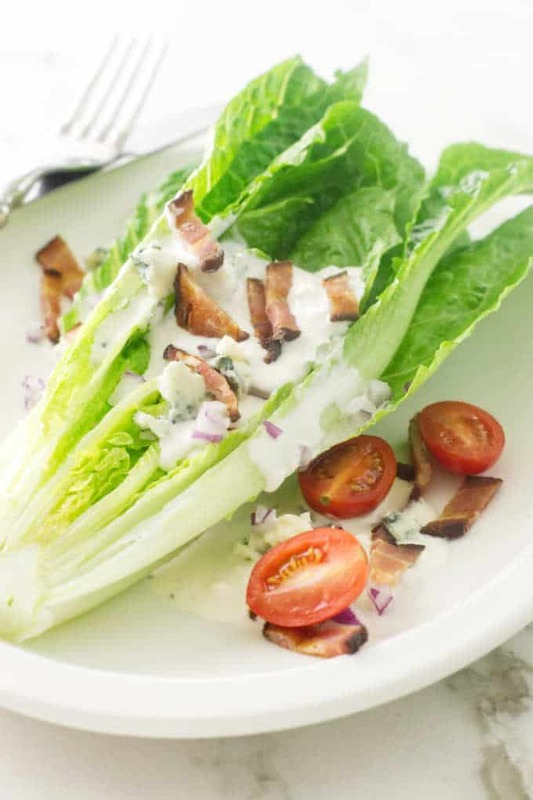 This bacon and blue cheese salad makes a grand entrance as a starter salad or a meal in itself as a lunch entree or light dinner. 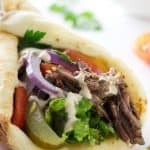 It is impressive, simple to prepare and delicious. 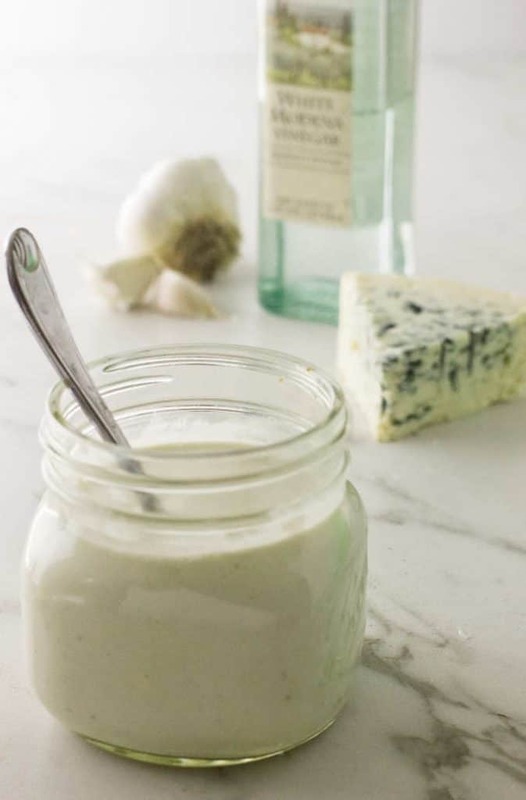 First, we made the blue cheese salad dressing. 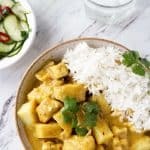 This is an easy dressing as all the ingredients goes into the blender. 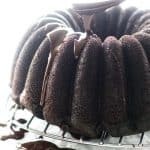 You can get the recipe here. 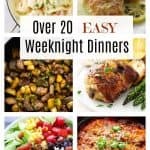 This recipe makes a fairly large batch of dressing and keeps well in the refrigerator for two weeks. 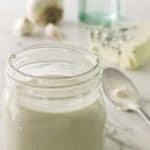 You could also use your favorite store bought bottled blue cheese dressing. We cooked four thick-cut slices of bacon in the oven until they were nice and crisp then drained them on paper towels. After the bacon was cool we cut the strips into nice size pieces. We used two heads of hearts of Romaine lettuce for the salad. They were sliced in half lengthwise and plated each half. For smaller size salads you can buy the Little Gems which is an heirloom baby Romaine lettuce. Costco has them in the produce section in packages of three or four. The blue cheese dressing topped off each serving of Romaine. Diced red onion, crumbled blue cheese and sliced grape tomatoes completed the salad. This bacon and blue cheese salad and a slice of whole-grain bread was all we needed for our lunch. After preparing this salad, I took my photos and sat down to enjoy my lovely bacon and blue cheese salad. About half-way through enjoying the flavors of this yummy salad I remembered the avocado that I had planned to add to the salad. Oh, well…..It didn’t go to waste as we ate avocado toast and poached egg for dinner later that night. Romaine lettuce is one of the most nutritious of the lettuce varieties. 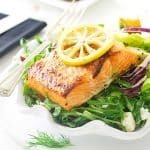 The Center for Disease Control ranks Romaine lettuce as one of the top ten “powerhouse foods”. Romaine lettuce is packed with fiber and vitamins, especially the A and B vitamins. The Caesar salad is another classic that uses hearts of Romaine lettuce. No substitutes of, it has to be Romaine lettuce! 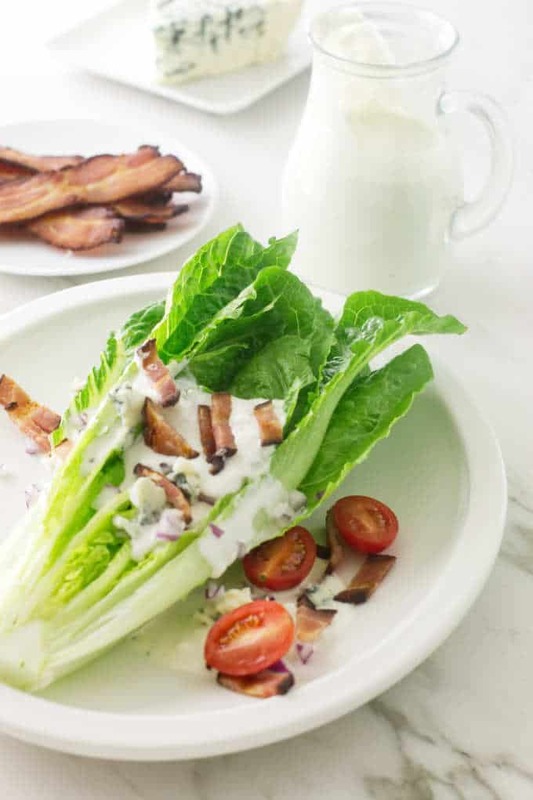 Bacon and blue cheese salad made with hearts of romaine lettuce, creamy homemade blue cheese dressing, bits of crisp bacon and sliced grape tomatoes. Set a wire rack over a foil-lined baking sheet. Add the bacon slices to the wire rack and transfer to the oven. Roast for 8-10 minutes, until crisp. Drain on paper towels and when cool, chop into pieces. Trim the ends off of each head of Romaine and slice the heads in half. 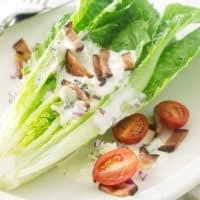 Place a Romaine half on each of 4 chilled salad plates and pour 2 or 3 tablespoons of blue cheese dressing on each serving. 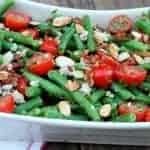 Divide the bacon, diced onion, tomatoes and crumbled blue cheese equally to each salad. 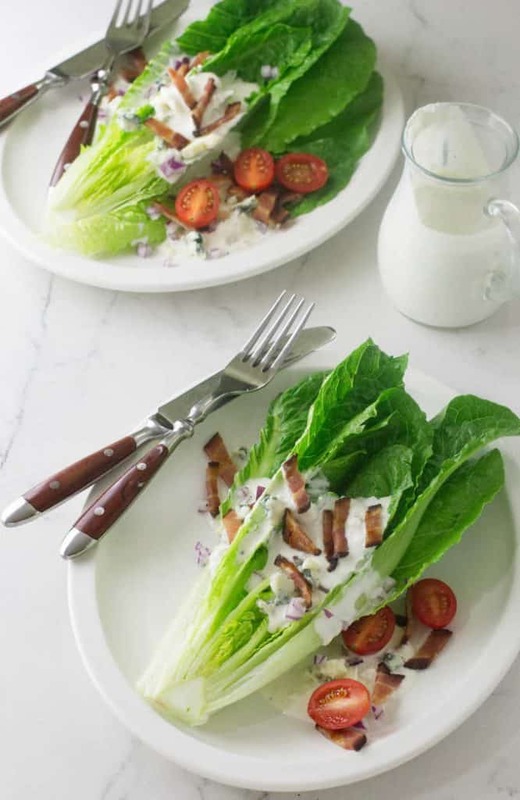 Blue cheese dressing goes so well with romaine, doesn’t it? Love that combo and this salad. This could easily be dinner for us — maybe with a nice dinner roll, too. Thanks!